Taking a child to the dentist can be a challenge, but some offices are so good at what they do, it takes all of the hassle away. Bright colors, fun stickers and toys, and kid-friendly toothbrushes all make the experience more enjoyable. 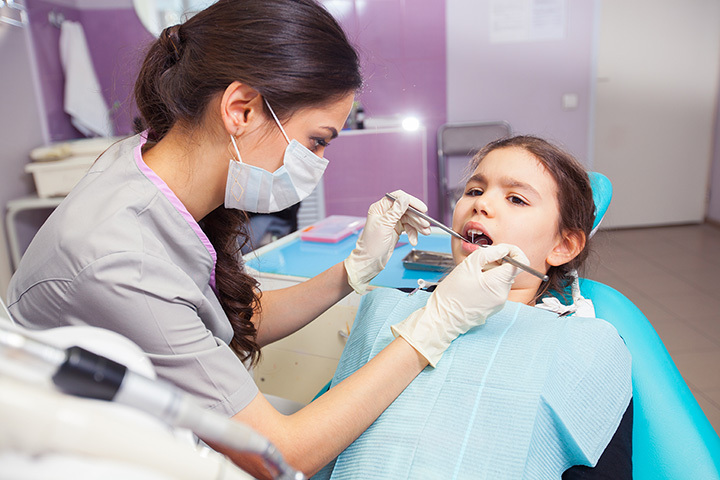 Here are the 10 best kid-friendly dentists in New Mexico! Kids come first with Dr. Shaw as she helps young people learn to practice good dental health. From the space-themed waiting room to a Kirby the Chimpanzee presentation about dentistry, this is a kid-centric place. Parents are welcome in the treatment room where, at a first visit, children are given a thorough examination that ends in a personalized treatment plan that focuses on prevention. Every visit ends with a trip to the toy box and an organic fruit bar as a treat. A child’s first birthday is the kick-off for regular dental visits. Brothers, Dr. Kris and Kelly Hendricks, help make this first visit a positive one for both child and parent. The goal is to guide a child to a healthy mouth and a winning smile and that begins with a pleasant, fun and enjoyable experience. The staff here help parents and children navigate everything from when to begin using toothpaste to how to deal with a toothache to hints to help children stop thumb sucking. Check out the surfboard exam room. Super excited to be in our new office. Come visit us! “Where kindness and dentistry meet,” that’s the motto at the Children’s Dental Clinic of Las Cruces. The team of doctors at this office are highly specialized and have experience working with young ones. If you visit their website, you can get an office tour, which reveals and fun and bright atmosphere. Their website even features fun games for children to enjoy, as well as a glossary of important words related to dental hygiene. Not only does this space put your child at easy during their visit, but it can also be an educational experience. Regular checkups are the secret behind good dental health. The team of dentists and hygienists here know their way around a pick, a probe and a retractor and can easily calm even the most fearful child. From toddler to teenager, they teach young people how to implement healthy oral hygiene habits. Brightly colored murals decorate the walls. The office staff keeps the experience lighthearted and relaxed. A visit here is worth smiling about. Step inside and enter the kids zone. Dr. Gunning takes the time to get to know his patients, from the youngest to the oldest, putting them at ease in the chair. His concern for making sure children are not afraid ensures that kids come back again and again. Services include general cleaning, fillings, implants and cosmetic dentistry. The dentist here is a hometown boy. Dr. Nichols was born and raised in Los Alamos and now lives in town. A visit here is all about comfort. There are TVs on the walls and ceilings in all the exam rooms. A fun area helps kids relax and play before slipping into a chair. He’s big on safety and only uses digital x-rays and BPA-free filling materials. Swing by and give Olaf a hug in the play area and high-five turtle Leo out front. Getting children to understand the why of good oral hygiene helps them to understand the what of taking care of their teeth. This puts them on a lifelong path to healthy teeth. The entire staff is focused on teaching the ins-and-outs of brushing and flossing, preventing tooth decay through nutritional guidance and the importance of fluoride treatments. Plus, there are movies in the treatment rooms which makes everyone smile. The goal of Dr. Sjostrom is to provide a fun and easy dental experience for kids. With children being Sandia’s only patients, their specialized training has a strong focus on meeting their needs. Sandia is also a small practice, which creates a much more family environment. These factors, along with being equipped with the latest technology and services, makes Sandia and excellent option for your little one. The tooth is the only part of the body that can’t repair itself. That’s why dentists like Dr. Valda are so valuable. They can fix teeth. Dr. Valda can not only fix teeth, he makes sure it’s not scary or painful. That makes him the children’s choice in town. Cleanings, exams, extractions, fillings, caps or orthodontics, he and his staff can do it all. Smiles in town come easy to Dr. Bonura. She was born and raised here and now serves the community as a true family dentist. She’s particularly good with children who relate to her gentle and compassionate nature. Since she treats the whole family, every member gets a lesson in good dental care. Her focus is prevention and she promotes techniques to support that, including fluoride and sealants.